Before 2007, when he launched what became his series of Department Q novels, Jussi Adler-Olsen was hardly a brand name in the field of crime fiction; his earlier output of lengthy political thrillers in international settings caught little worldwide attention and was barely noticed even in his native Denmark. But as soon as he narrowed his scope to Department Q’s domestic scenes and characters—portrayals infused with sharp Danish humor—a lasting success both at home and abroad was in the offing. This reversal of fortune might now be reversing back to its ground zero. As much as Adler-Olsen’s pre-Q dabbling into big things American in The Washington Decree (published in Denmark in 2006) harks back to impulses from 9/11, its recent translation into English emerges under new clouds above the American capital. An Afterword spells out how its source of inspiration was the slew of funds and authority beyond the control of Congress that was bestowed on FEMA after the terrorist attacks in 2001—to which the author adds that “it is, among other things, this movement from democracy to autocracy that I have tried to deal with in The Washington Decree.” Who would not call this good foresight, or the present translation timely for the current state of affairs? 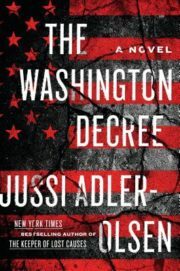 In fact, Adler-Olsen’s premonition stretches from cover to cover, as he also offers a factual Foreword in which he laments how “unfortunate circumstances cause the president of the United States to lose his good judgment and, despite his best intentions, unwittingly set [the] chain of events in motion” that unfold in the course of his narrative. Moreover, “We’ve seen this kind of situation arise before, and it will arise again. And it can happen suddenly, before you know it.” Indeed. Dated “Autumn 1992,” Chapter 1 of The Washington Decree features the governor of Virginia, who has recently pulled off a popular TV quiz show and now wants to complete his stunt by inviting the top five contestants to join him on a broadcasted trip to China. While relaxing there, the party witnesses his wife’s brutal murder before its eyes, and what follows in the next forty-four chapters is an intricate drama across much of America’s political landscape, triggered by the overseas killing and with the travelers, including the governor’s advisor, as its main characters. Beginning with Chapter 2, dated “Fall 2008,” the governor becomes a winning candidate for U.S. president, and lo and behold, his second wife is murdered as well, on the very day of inauguration. An America in turmoil sinks into a swamp of dystopian events, while its head of state forges ahead with an agenda as utopian as its execution is dire. His principal objective is to rid the land of its firearms and to release most of its prison inmates to service their community as advisors to youngsters at risk of winding up behind bars themselves. The exception to this radical reform policy is the treatment of murder convicts, who will now be rapidly executed without much ado. Not surprisingly, progressiveness with such vengeance—armed in execution-style law and order—is both an appealing and appalling contradiction in terms. Delusional in its self-righteousness, it lacks remedies to prevent it from spinning out of control, and the president’s gift for rationalizing and humanizing his nightmarish police state only adds insult to injury. Adler-Olsen deserves credit for narrative skills that make multiple causes and effects of the ensuing societal downturn come across as accidental before they are proven to be cogwheels in a maliciously crafted machine of evil, of a deliberate usurpation of power. The author’s gift for compositional rhythm and plot design, and for deftly shifting points of view, spurs the reader to identify and tentatively combine quite a number of narrative puzzle pieces—until yet another viewpoint offers verification, or falsification, of the effort. Up to this point, the conspiracy evolving behind the president’s back has been a plausible crime, soaked in verisimilitude; expert guidance during the author’s research visits on location is explicitly acknowledged. But from here on out the evil-doers are depicted with increasing hyperbole. Like an addictive steroid, the effect of such an inflation only tends to pale as the dose increases, and with the transport into fantasyland comes a certain distraction and boredom; the moment the exaggerations come across as obvious manipulations, the novel crosses the line behind which it was earlier most engaging. One wonders if this departure from perceptive realism might be beholden to Nordic noir. The last numbered chapter, 45, follows an attempt on the president’s own life, which he, but not his assassin, survives. Meanwhile, the person falsely accused throughout is proven innocent, and the man’s daughter and another quiz-show character finally seal their nuptial pact. But is it truly a happy ending in a political novel for happiness to occur only after politics has imploded? The Washington Decree’s formal ending, an unnumbered chapter titled Epilogue, may hold the answer, as it offers a panoramic view of the U.S. post-catastrophe. A new president has been sworn in, and responsibility for the past malaise seems reasonably allocated. While not deemed guilty of the crimes committed by his regime, the former office holder is found to have been unfit for office all along and therefore exiled from politics and the U.S. mainland, where only the genuine part of his legacy will remain. Sensible as these outcomes may sound, they ring about as hollow as the ousted executive’s deceptive rhetoric. And true enough, after the dust has settled and the narrative has come full circle, with the surviving characters from Chapter 1 meeting one final time around this now-exiled man, one of them incidentally overhears him talking on the phone, ordering his compliant successor to do what he himself would have done. Nothing but appearance has changed. What looked too good to be true has been proven too good to be true. The shadow of the past continues to govern the present, and the truth is out. With the line that separated the former president’s dubious good from his attempted killer’s indisputable evil shown to be entirely porous, Adler-Olson wraps up his image of America’s political life as the sink hole incarnate. This entry was posted in Uncategorized and tagged Spring2019 on April 17, 2019 by Kelly.